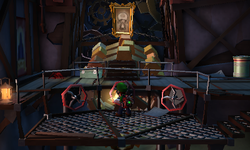 The Synchronization Room (Synchronisation Lab in the PAL-version) is a room inside of the Old Clockworks in Luigi's Mansion: Dark Moon. The Synchronization Room is only accessed by going to the far left inside of the Synchro Gantry. The Synchronization Room room is a small room with many gears in the background. There are three large gears that can be moved by turning the valves on the south. The hole to the right leads back into the Synchro Gantry. During C-5: Piece at Last, Luigi must make his way to the Synchronization Room in order to learn the whereabouts on the Toad assistant. When Luigi gets to the room, he sees the Toad assistant trapped inside a portrait behind three gears. In order to reach the Toad, Luigi must move the valves, one of which must be revealed by the Dark-Light Device, so that he can walk between the gap of the gears. After freeing the Toad, Luigi has to fight two Greenies with paranormal shields. This page was last edited on November 10, 2017, at 19:48.